Benny Greb is one of Germany’s most appreciated and active drummers. In addition he has his own trio called “Moving Parts”. Their first live album is out now. Every now and then people ask me, if I also review CDs. Well, I do – as long as I like what I hear and think that more people need to find out about the mere existence of a certain record. There is such an incredible amount of music out there. And it has never been easier to get access to old and new sounds from all over the world for a ridiculous amount of money. While many musicians argue that the quality of songs today is as low as the amount of fat in a fat-free chocolate, good music is still around – it always will be. The people from Meinl think Benny Greb’s new CD is a record which fits into the category of “great new music”. Therefore they sent it over to me. Even though I was not a fan of the Moving Parts debut, I was curious enough to give this new one a listen. After all it’s Benny Greb, whom I highly respect as an innovative drumming artist. Of course reviewing a record is such a personal thing. You cannot argue about taste, can you? However, let me try to describe what you can expect, if you tune in as well. 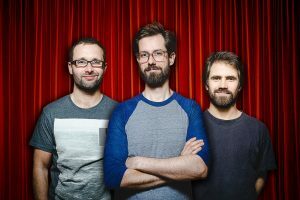 So, in 2014 Benny Greb founds his own band project, a trio called Moving Parts. His bandmates are Chris Montague on guitar and Kit Downes on keyboards. Both are from Great Britain and both are musical nerds, just like Benny Greb is one. Together they record the self-entitled album Moving Parts. They start touring and always press record when they hit the stage and play. Two years later in 2016 Benny Greb wins the German Jazz Echo in the category national instrumentalist of the year / Drums for this same album. Also two years later the band releases album number two: Live. After ripping off the wrapping, I open the CD case and look for the booklet. I can’t find it. There is none. Why not? There are some text lines, but it’s all about who produced and recorded the album and who wrote the songs. Can’t miss to say thank you and to mention your endorsers as well. Since only drum companies are listed, I better get ready to listen to a drummer’s album. But first let me check the track list. 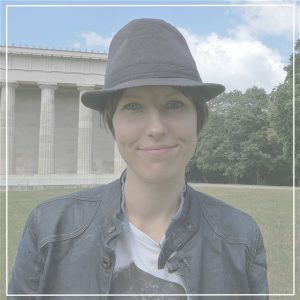 Are the songs the same ones as on the studio record, but now played live? 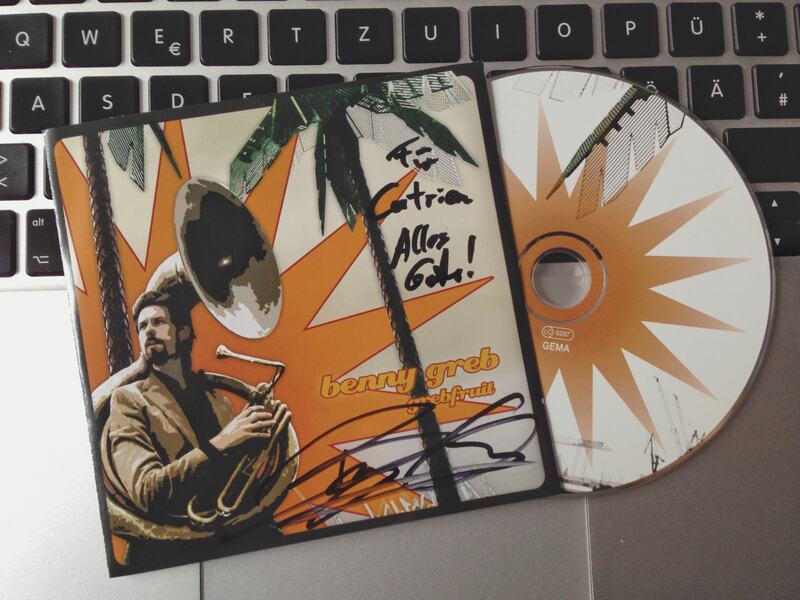 Long time ago Benny Greb signed his CD Grebfruit for me. No, they are not. Some seem familiar and as a matter of fact Bunker, Soulfood, September, Barking and Delta are also on the studio record. For 3/5 tel, Nodding Hill and Next Question it’s not the first time on a record either. As a fan of Benny Greb, you might recognize the songs from his record Brass Band. Okay, there is one more song called Twist. That’s an old one as well. 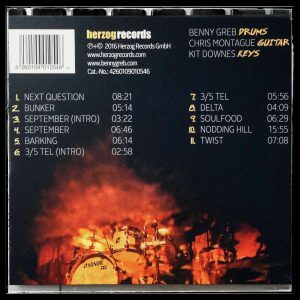 I remember it from Benny Greb’s first solo record Grebfruit from 2005. 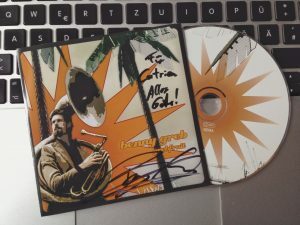 Hey, I even have Benny’s autograph on that CD. Anyway, nothing new really, is there? Well, first of all songs change along the road. And secondly this trio started as three outstanding musicians jamming together. Consequently playing live should be their forte anyhow. That’s when the three music nerds can mix up their improvisational skills once again and receive a direct response from an audience for it. Hence there is a dfference. Back side including the tracklist of the album. The audio quality of the record is very good. 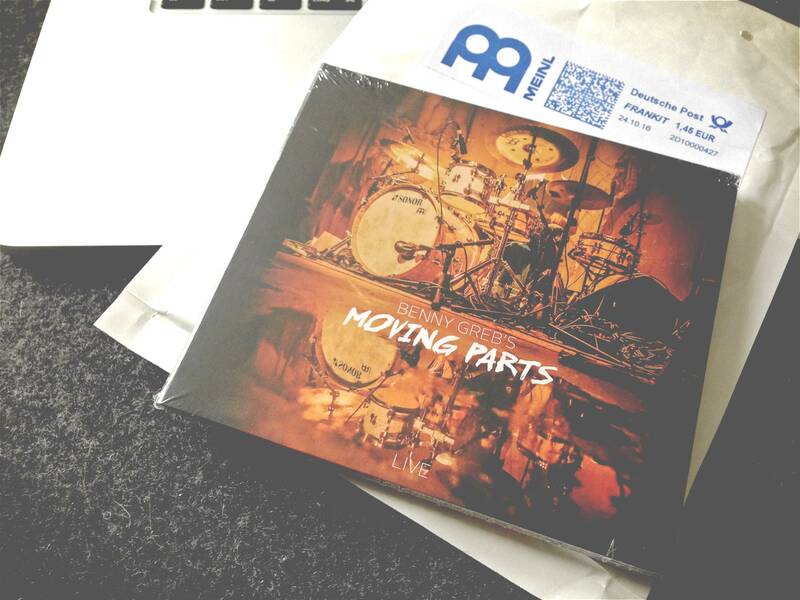 Moving Parts might as well sell it as a studio album. What about the choice of songs? You hear Fusion, Ambient Jazz, electronic sounds and even some Rock ‘n’ Roll. The playing is very tight and the communication amongst the three players is excellent. Sudden tempo and rhythmic changes are taken with ease. Will drummers hear some licks? More than enough. You’ll also hear a typical Benny Greb solo – bars filled with great technique, musical finesse and Benny’s humour. In general Benny Greb is very playful behind his kit. There is no doubt that he is an excellent musical drummer. But sometimes it’s a bit too much in my ears. Then the music seems abstract, like the soundtrack of a comic. Meaning, the music makes only sense together with the moving pictures – yet the latter are missing. The tunes September and 3/5tel provide a relaxing alternation.